Momentous news from the world of rayguns today. While the keenly anticipated hat-mounted laser cannon for pool sharks has yet to hit the consumer market, the Reg can reveal that the US military is working on a deadly beam weapon mounted on an R2-D2 robot. Not all that much like R2-D2, really. Hurrah! Enough to delight the hearts of Star Wars fans and raygun aficionados everywhere, surely. But, now that we've achieved the swingeing headline movie-reference quota set by cruel Vulture overlords, we should perhaps reveal that the R2-D2 in question is not actually a small bleeping maintenance robot with implausibly small wheels. Rather, we speak here of the "Phalanx" naval automatic gatling cannon installation, able to blast incoming missiles from the sky with a hail of radar-directed armour piercing shells before they can strike its parent ship. Boffinry chiefs from the Office of Naval Research, responding to questions from aspirant raygun-building contractors, have specified that the Phalanx's fast-swivelling pan-tilt chassis is the preferred mounting option for the new "Maritime Laser Weapon System". 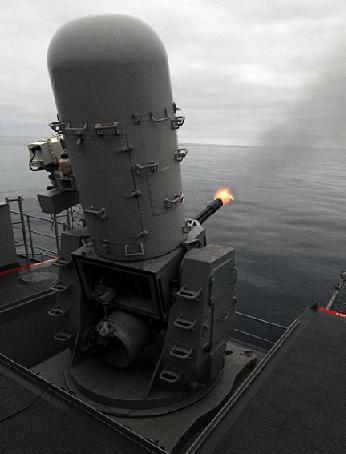 The Phalanx, as every robotic gun-turret enthusiast is well aware, is referred to as "R2-D2" by US navy sailors with flexible imaginations. Meanwhile the Maritime Laser naval beam cannon effort was announced in the last days of 2008, but the Reg raygun desk was having a little lie down at the time and we missed the initial solicitation. No matter: it was a fairly humdrum request for a "modular, open-architecture" high-powered solid state laser weapon which could be fitted to US Navy warships of frigate size and up. The requested blaster weapon was to have enough power to achieve "counter-material damage defeat" against "small boats ... and other targets of interest in a ship self defense mission role*". Offerors are highly encouraged to modify and use established and Navy Certified fire control solutions ... such as ... the Phalanx Mk 15 Mod 1B. Interestingly, Phalanx robo-cannon have lately been dismounted from ships and set up ashore to guard military bases in Iraq and Afghanistan from incoming mortar and rocket fire. In order to avoid peppering the entire local neighbourhood with cannon shells, time delay self-destructing ammo is used: but even so a fair amount of dangerous frag and duds get scattered about. *The robo-raygun defences would be an ideal counter to laser-packing sharks unleashed by troublesome submarine dwelling supervillains, for instance. 10% off £3k! Great! Wait, now it's £3,300? No, £4k. What?